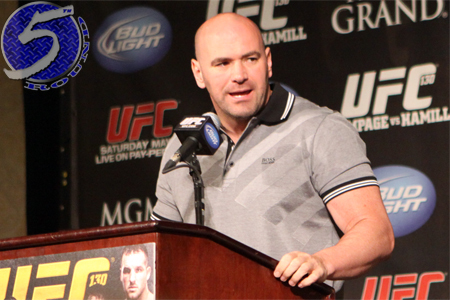 UFC and ESPN Extend Partnership Through 2013 in U.K. Fear not, U.K. fight fans. The UFC has announced they have extended their broadcast partnership with ESPN in the United Kingdom and Ireland through 2013. “Great news fans, UFC will continue to be aired on ESPN in the UK, giving the channel rights to all main live UFC events until August 2013,” UFC U.K. tweeted Wednesday morning. The extension allows ESPN to continue their live broadcasts of Octagon action, including shows airing on pay-per-view and cable television in America. The two powerhouses initially partnered together in 2009. Their current contract was reportedly expiring next month. The deal comes a few months before the UFC jumps back across the pond for “UFC on FUEL TV: Struve vs. Miocic.” That card takes place September 29th inside Capital FM Arena in Nottingham. Today’s announcement also comes as welcomed news for viewers of “The Ultimate Fighter.” The second international edition of the long-running reality series pits U.K. fighters against Australians. The season debuts later this fall.